Not a bad concept, but I'm really not sure how this fits with the jam theme. It didn't really take away any standard platforming mechanics. There's also nothing about it that's actually hack-and-slash. The controls seemed a bit unnecessarily awkward. There's no advantage to not having a sword equipped, so I think it would have worked better to immediately equip the next available sword after running out of a type, automatically equip a new one if you pick it up without another sword readied, and just use two buttons for cycling between them. Holding down middle mouse is also a decidedly weird way to use an ability, and I think holding shift or S (down) would have been more intuitive and comfortable. That all said, I do definitely like the idea of each sword having unique, often unexpected abilities, and I'm sure there are interesting ways to expand this idea. 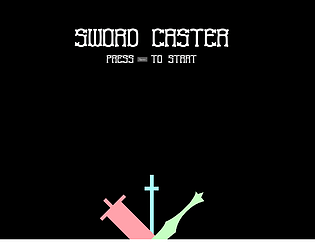 I like the game's concept, flinging swords to solve all your daily problems. My only real problem is with the controls. I would have preferred instead of switching states with L1, R1, and L2, those buttons just threw the swords. Making it a 2 step process limits how quickly you can expect a player to pick up and throw swords which limits the complexity of your level design. Actually throwing swords works well except when standing close to wall and throwing swords too far into the wall to stand on. The normal movement controls work well and seem to be rather forgiving. Riding on a thrown sword is awesome in any context, and I like that in the level they are introduced, you are required to not only ride it, but jump off and grab it at the same time to land on another sword. I think there is a lot of potential in making a full game out of this with a whole arsenal of blade types to build puzzles around. I just think the controls need to be a little more streamlined. Great game otherwise!